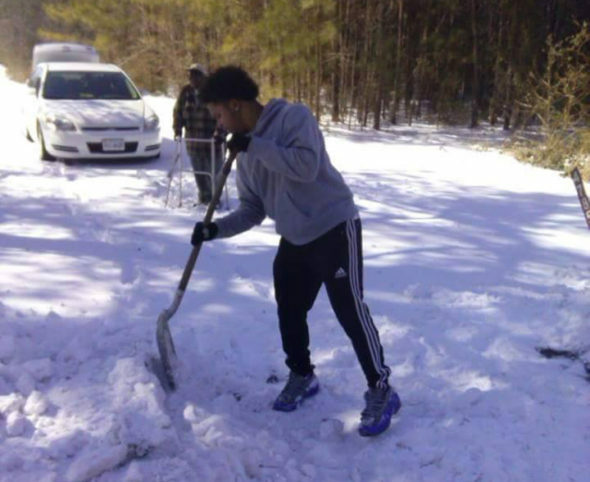 Virginia high school senior Tommy Adams, who was driving home from the DMV with his mother Teresa when they drove past an older man who was trying to shovel snow from his driveway. The man was using a walker to get around. He asked his mother to stop the car, saying, “There’s an older man with a walker shoveling snow — I’ll help him out,” she added. Teresa snapped a photo of her son’s good deed. That photo was later shared on the WTVR Facebook page. Tommy said it appeared a plow had driven by and built up the snow on the man’s driveway. He said the snow was deep and it took him more than 15 minutes to clear the driveway for the man. “He said ‘God bless you, the world needs more people like you,'” Tommy said. Tommy said he did not catch the man’s name at the time, but he was glad he was there to help. “I try to do good for the elderly because one day I may need help too,” Tommy said.